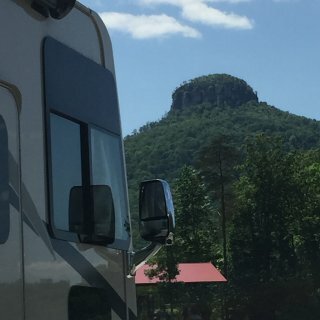 This is a great RV park for an overnight stop or if you are in the Little Rock area for a few days. Easy to find and reach if you are traveling East or West on I-40 or I-30. The park is not fancy, basically a large parking lot, but big rig friendly pull throughs and the entire park overlooks the river and downtown Little Rock. There are plenty of green common areas along the riverside to sit or picnic if you want some open air spaces. The park sits right next to the Clinton Presidential Bridge which is really a greenway that connects one side of the river to the other, and allows you to access over 10 miles of biking and walking trails, plus access to Clinton presidential library if that is your thing. Park is gated at night which adds a bit to the security. Very clean and seems to be well managed. You literally are overlooking downtown Little Rock, so if you stay for a few days lots of places to go and see there. If you have bikes the greenway access next to the park gives you miles and miles of walking or biking. We camped at Downtown Riverside RV Park in a Motorhome. Nice park right off of I40, yet far enough from the highway that road noise is not a factor. Very clean. There is a section towards the back that has long term campers, but everything looked nice and well taken cared of. Interior roads are wide and easy to navigate if you have a big rig. Great overnight stopping point. We camped at Oasis RV Resort in a Motorhome. If you have time visit RV Museum in Amarillo very interesting and free. Also Cadillac ranch art installation is less than a mile from campground. Both can be visited if you have about two hours to spare. Very nice park located in an urban setting. About 30 mins from Dallas, Plano, or Fort Worth. Concrete pad, paved interior roads. Some sites have a slight slope either at the back or front. Ours had it both back and front but was still long enough for us to level our 39' Motorhome. Park is very clean and well taken care off, and gated after dark. Friendly staff. Would definitely stay here again if in the Dallas-Fort Worth area. We camped at The Vineyards in a Motorhome. The little town of Grapevine is beautiful. Spend time on Main Street. Lots of wine tasting shops, breweries, shops, cafes, and restaurants. If taking trips to Dallas-Fort Worth add about 20 mins to whatever your GPS says as traffic is heavy, especially during rush hour times. This park is right off of I40, about 15 mins from old town Albuquerque. Sites provide adequate spacing. Well maintained. Friendly staff. Good WiFi , cable TV, and offers free continental breakfast. My only real issue is The noise from I40 is loud and is at all hours of day and night. If you stay here look at Site maps as some sites your front window is literally looking at I40 up close and personal and I can only imagine those are extra noisy. We camped at American RV Resort in a Motorhome. Great RV conveniently off of I40 yet far enough that road noise is not a factor. Big rig friendly. Interior roads easy to navigate. Friendly staff, nice camp store. Offer discounted diesel and gas to campers. Clean, well cared for park. We camped at Meteor Crater RV Park in a Motorhome. Beautiful RV park, just 10 minutes from the strip. Far from interstate in a residential neighborhood so nice and quite. Only accept Class "A" motorhomes. This is a private ownership park, so you need to go through booking agent at LVM. Would definitely stay here again if visiting Las Vegas. We camped at LVM Resort in a Motorhome. This campground offers 14 pull through sites that are full hook-up and probably a 100 or more that are dry camping (separate section). The F/H sites go fast so if this is what you need, book way ahead of your stay. The sites are BASIC, gravel/dirt, that's it. However incredible views of the mountains and sand dunes. There is a general store, gas station (with significantly cheaper gas prices than in Furnace Creek), a good saloon and restaurant. You can use all of the facilities from the hotel across the street if you book a F/H site. This is a good alternative if you can't get into the Furnace Creek NPS campground and you need/want full hook-up. About 23 miles from Furnace Creek. We camped at Stovepipe Wells Village RV Park (Concessionaire Operated) in a Motorhome. Before you go, buy a booklet called "Road Guide to Death Valley National Park" by Robert and Barbara Decker. Very inexpensive, bought on Amazon and best guide to everything you will want to see, hike, experience in Death Valley. Beautiful campground, clean, well staffed and managed. Big rig friendly all interior roads are paved, wide and good turning radius. Sites are gravel, spacious, and level. Very close to Tombstone and WAY better than any campground in Tombstone. You are out in the middle of the desert, so absolutely no traffic noise and star filled nights. We would stay here again if in the area. We camped at Tombstone Territories RV Resort in a Motorhome. Check with office staff, besides Tombstone there where a lot of other interesting places that we didn't even know about nearby. Well maintained and very clean. Big rig friendly. Interior roads are wide and paved with good turning radius. Sites are gravel with cement patio. Good adequate spacing between rigs. In the middle of San Antonio so you are less than 10 mins from historical city center. Others have written that this park is in a ghetto or sketchy. While true that this a lower income section of town, its fine. About a mile from here there is a huge shopping district with Home Depot, Walmart supercenter, restaurants, etc. We would definitely stay here again if in the area. 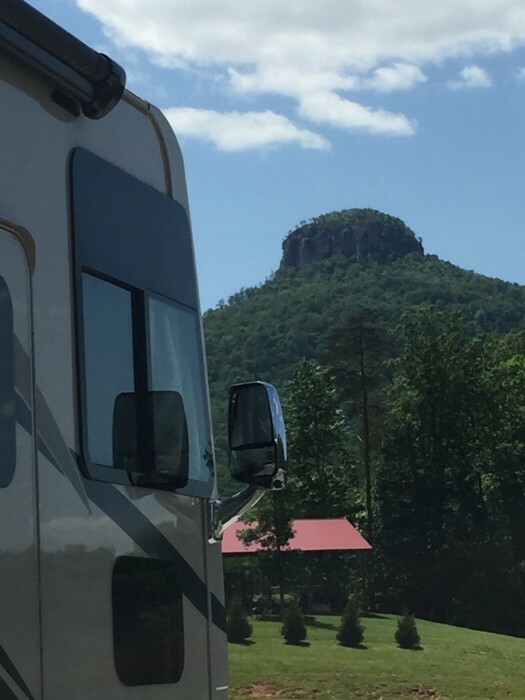 We camped at Travelers World RV Resort in a Motorhome. Mission San Jose is a 2 minute car ride from here, beautiful world heritage site. Biking trail along river right from campground. Save money and parking hassle in city center and take the city bus into downtown. Bus stop is right in front of campground. This park would be great if you are here when its not raining. Unfortunately for us we arrived under a downpour and our site, beyond the very narrow concrete pad was flooded. Our site had some pavers on the grassy area so you could skip from puddle to puddle. By the time I hooked up my rig my shoes were muddy and thoroughly wet. Great access to I-10 but if in the area again I would shop around for another place. We camped at Gulf Coast RV Resort in a Motorhome. Beautiful, small, privately run RV park. Very clean, well managed and quiet. Great place to spend time or like us an overnight stop, conveniently off of I-10. I wish all RV parks where managed like this one. No cable but good strong TV signal. We camped at All About Relaxing RV Park in a Motorhome. If you plan to stay for a while and you have have a satellite dish ask for a site that doesn't have trees on it, ours did and we could not use our satellite. No big deal for us as it was just an overnight stop, and we chose to hang out outside and enjoy the night. This is by far the best campground in Angel Fire area, or for that matter, in Enchanted Circle loop. All paved interior roads, cement pads, good spacing between sites. Good WiFi and easy to maneuver with a big rig. Has wonderful 1 mile hiking path around campground and clubhouse. When you stay here you also get access to Angel Fire Country Club which has a pool, fitness center, golf course, restaurant and much more. Park is gated for additional security. We camped at Angel Fire RV Resort in a Motorhome. Beautiful state run park minutes from Colorado Springs. Campsites are tucked into the mountain with great views of the valley and the mountains. Hiking trails are all over. It is about 30 minutes from Pike's Peak entrance, about 20 minutes from Garden of the Gods, and about one hour from Royal Gorge. Park is immaculate. Sites are big and well spaced from each other and easy to maneuver with big rigs. The park sits across Ft. Carson Army base, so the only drawback is you will hear taps at 10:30PM and revele at 6:30AM every day when the army blasts it out to the entire base. We actually did not mind - found it kind of nice since you are far away enough that it comes across very softly. We camped at Cheyenne Mountain State Park in a Motorhome. Safeway grocery store about 2 miles away and big shopping mall about 4 miles away on I-25.